aerobd.news : Dutch airport operator Royal Schiphol Group has announced that all of its airports will run on sustainable power generated in the Netherlands from the start of next year. A large portion of this energy will be generated by a newly built wind farm in Vianen, which is set for completion in January 2018. This will be complemented by other national sources of sustainable energy until further wind farms are built. From January 2020, the airport plans to only use power generated by wind farms. 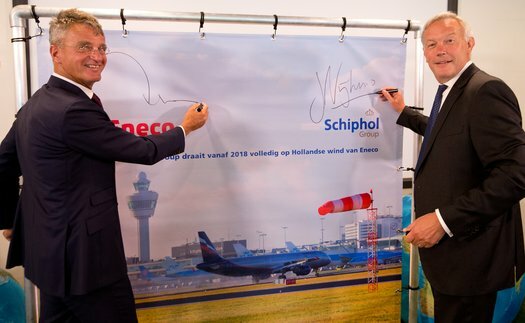 In the meantime, utilities company Eneco will provide enough sustainable electricity to power Amsterdam Airport Schiphol, Rotterdam The Hague Airport, Eindhoven Airport and Lelystad Airport. Together, the airports consume around 200GWh, which is the rough equivalent of 60,000 households.